We shared the amazing news about Chanel a few weeks ago after she was honored with an induction into The Fragrance Hall of Fame. The honor was well deserved; Chanel's many accomplishments ans innovative ideas throughout the years have helped women look and feel their best. Chanel also has a philosophy she lives by that states "a girl should be two things classy and fabulous". Take a look at some of the hot outfits we love from her Fall Fashion Preview in Paris. We picked three outfits that really popped. This look is a elegant version of a tunic over a pair of leggings. The silky looking fabric and glimmery underpants puts it in another class. The scarf accessory dresses it up well. If ever there was a way to keep your style simple and on one accord, layering in the same color palette does the trick. What a way to stay stylish during the winter season. To the office and ready with this pulled together warm look. The belt does the trick, and the shoes kind of catch the eye by surprise. Our last Chanel look that we had to show you is classic in a way because of the sleeves. We all can appreciate a blouse that shows off our waistline but gives us a little extra room in the arms to hide the little extras. The details on the collar and in the center are great attention getters. We love it from head to toe; she looks amazing. The clothes are not the only thing that everyone was talking about during and after the show. Some members of the media made it a point to talk about the hair and brows of the standout models walking the runway. Let's take a look at what photographers caught backstage. Yes, it was all about the bejeweled eyebrows and the pulled back ponytails. The look made everyone take a second look and drew attention to the their opened up faces, giving them a youthful, eccentric look. 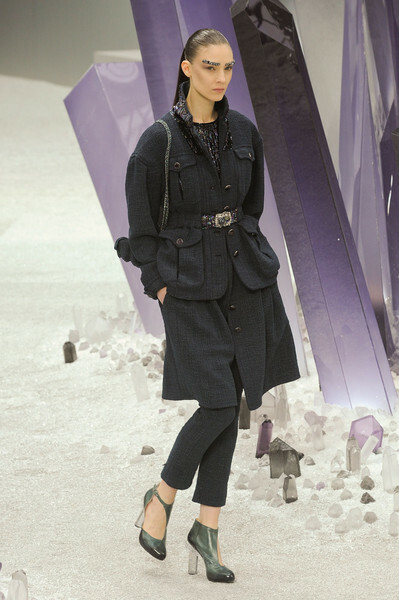 We love what Chanel did for this show. The models looked great and the clothes are breathtaking. Triggerz Got No Heart is the Debut Release of New Orleans Artist Nice Gunz featuring Rapper BTY Young'N and a tribute song called Feel Like Boosie. This release gives fans of that New Orleans sound a chance to experience true hood word play and the creative expression of a real Uptown Dude who grew up in the inner city of New Orleans and found a way to express his real life issues while putting fans up on that real. It's what's still hot and always relevent. It's ten songs of that banger music!